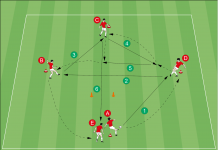 For a coach, exercises and competitions that take place in a circle are easy to manage. 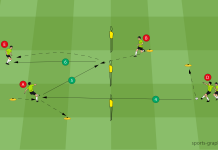 With this drill, the players are challenged to find creative solutions to stay in possession of the ball. 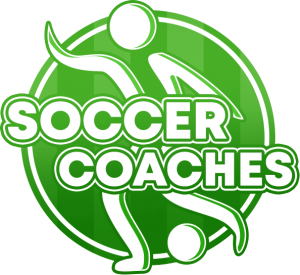 The main objectives are an improvement in precise passing under pressure and quick transitioning from defense into offense – the counter attack. Players will have to switch into defense immediately after losing the ball. Because players that are positioned outside of the circle, are limited to three passes between themselves. They will have to find a gap within the defense to pass the ball to a teammate positioned in the center. 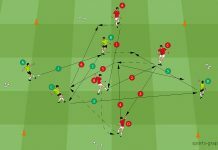 Create a circle (15 to 20 m), six players of the attacking team position outside of the circle. Two players of this team are positioned with three defenders within the circle. The outer players try to hold possession of the ball with the support from players within the circle. A maximum of three passes are allowed between the outer players. Ten passes without a defender touching the ball equals one point. If the defenders gain possession, their goal is to play three passes despite pressure of all the other players. If the defenders succeed, they score three points. 5. Which team scores more points? The central player intentionally makes use of changes in tempo and orient at all times to be open for passes. If the attackers lose possession, they must enter counter pressing as fast as possible.